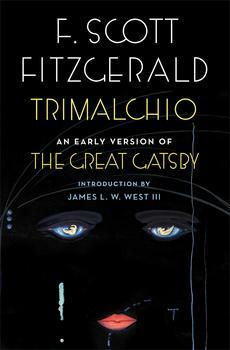 In what must be the worst marketing email ever written, I have discovered that Simon & Schuster has made Trimalchio, F. Scott Fitzgerald’s early version of The Great Gatsby, available as an e-book/Kindle. We own the hardcover, which was $40-something when we bought it(! )—and are happy to have it—but this is a much better bargain at $9.99. While the bones of The Great Gatsby are clearly there, as a writer and a reader it was shocking to come across a number of changes and rearrangements. For example, there’s a scene where Daisy shows up at Jay’s house and is ready to run away with him (she even has a suitcase). He refuses, saying that the point is that she needs to renounce Tom or some schoolboy ridiculousness that barely seems plausible. Another early flaw is that we don’t learn Gatsby’s background until the book is almost over, in Chapter Eight (of Nine), when (IMHO) it might be a little late to gin up some sympathy for him. And that awful title, of course.